On 6 October 1995, the Congregation for the Doctrine of Faith (CDF) published a Notification regarding the True Life in God messages. The Notification had been issued without any discussions or contact with Vassula. After the Notification was issued, Cardinal Ratzinger was asked about it on more than one occasion by supporters of Vassula. "On the basis of what you have told me in your letter about testimonies and conversions, that is very good. We only want you to proceed with discernment, - do not take as the word of God what is considered, for the moment, only human and personal. What we have said is that she should not witness in churches because she is an Orthodox and her marital status is not yet clear, being divorced, - and which we are studying. "You may continue to promote her writings, but always with discernment." In a published interview with theologian, Niels-Christian Hvidt, in 1999, Cardinal Ratzinger was asked about the Notification and commented, "...the Notification is a warning, not a condemnation. From the strictly procedural point of view, no person may be condemned without a trial and without being given the opportunity to air their views first. What we say is that there are many things which are not clear. There are some debatable apocalytpic elements and ecclesiological aspects which are not clear. Her writings contain many good things but the grain and the chaff are mixed up. That is why we invited Catholic faithful to view it all with a prudent eye and to measure it by the yardstick of the constant faith of the Church." When Cardinal Ratzinger became Pope Benedict XVI after the death of Pope John Paul II, Cardinal Levada was appointed head of the CDF in his place. Cardinal Levada was subsequently asked to clarify the current position with regard to Vassula. 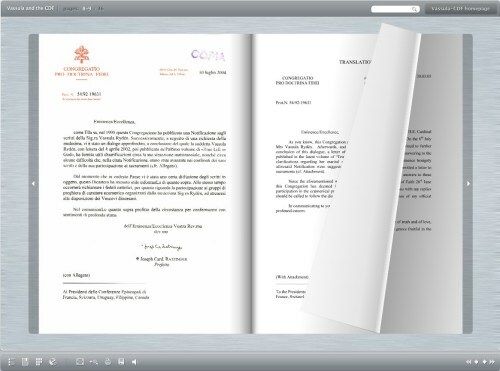 In January 2007 he sent out a letter the contents of which conflicted somewhat with what Cardinal Ratzinger had told Vassula during their meeting, although confirming that Vassula had clarified some of the concerns of the CDF. An authoritative, detailed account of all the Vatican's communications with Vassula (2001 - 2004) can be read HERE.